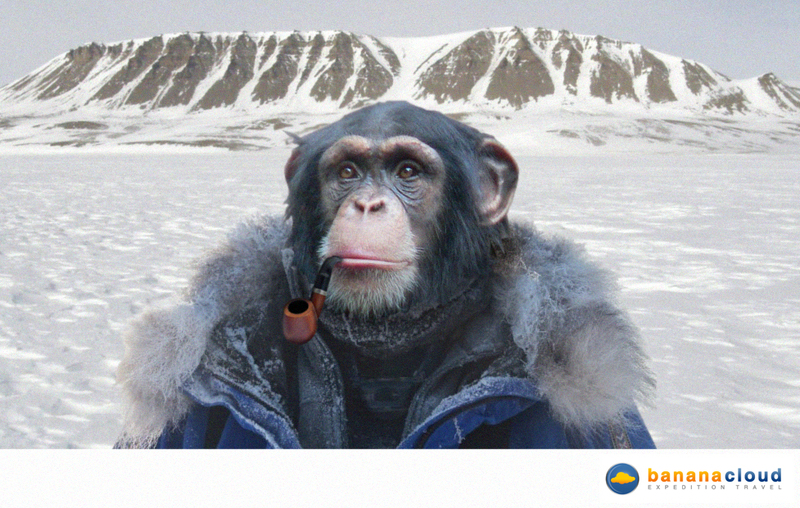 The Kit Chimp is Banana Cloud's very own Arctic monkey. Although he specialises in cold weather expedition clothing, equipment and survival techniques, he also has an encyclopaedic knowledge of, among other things, everything needed for tropical and temperate expeditions, adventure races, general travel, mountain and road cycling, climbing and bananas. Hi Dan. Thanks for your email. The simple answer is 'no'. A fleece and waterproof shell will be sufficient for all the activities, but you will need a ski-jacket or some other synthetic or down insulated jacket for inactive times (such as eating a banana). Our colder adventures would require a proper expedition parka, but they can be hired from us for a small fee. Have a look at our cold-weather page for more info. Well hello there Miss Pinkie. During the day, correct layering and the use of mittens rather than gloves will make a big difference for those who suffer from the cold. At night, a very warm sleeping bag (available from us if needed) and a fleece liner to reduce the air space around you should keep you toasty (small/slim people generate less heat and also lose more heat through convection in sleeping bags too big for them). Eating slow release carbs will also help to keep you warm and, it that happens to involve bananas, the high levels of potassium will aid circulation. Hola Julia. You must remember that the road to perfection is a long one. The magical ingredient is toasted coconut (2 table spoons). This goes in to the blender with the 3 bananas (for God's sake, peel them first), coconut milk, pineapple juice and rum (dark and white if possible - be generous if you want to flop on to the Banana Cloud ASAP). Enjoy. In line with Banana Cloud's commitment to the preservation of animals in their wild environment, The Kit Chimp image is a digital rendering based on a photograph of a wild Chimpanzee.